This ambitious Single Ended Hybrid Amplifier Evergreen Audio opens up an entirely new world of sound experience. It convinces with physically, rich basses and a filigree resolution. Its transparency and its impressive performance potential can be attributed to the selection of high-quality components and sophisticated circuit architecture. In the preamplifier section two pentodes care in triode for open and spacious tube sound with the desired harmonic proportions. A well-sized, discrete Class A transistor output stage in push-pull operation provides sufficient power reserves for the most common headphones. The full metal housing is made of sturdy anodized aluminum. It is available in black and silver. The front panel is polished nickel-plated brass and High gloss. As coupling capacitors for the low-loss Audioweg MKP types from Jantzen were used, resulting in a high intensity and powerful expressiveness yields. In order to allow an optimum layout design, a double-sided circuit board was installed. The separately housed power supply consists of a potted toroidal transformer and low-ESR capacitors from Vishay (Rödersteiner). In order to ensure optimum smoothing was additionally filtering a transistor used. The connecting cable of power supply to the amplifier is well screened to ensure that no stray fields can be induced. 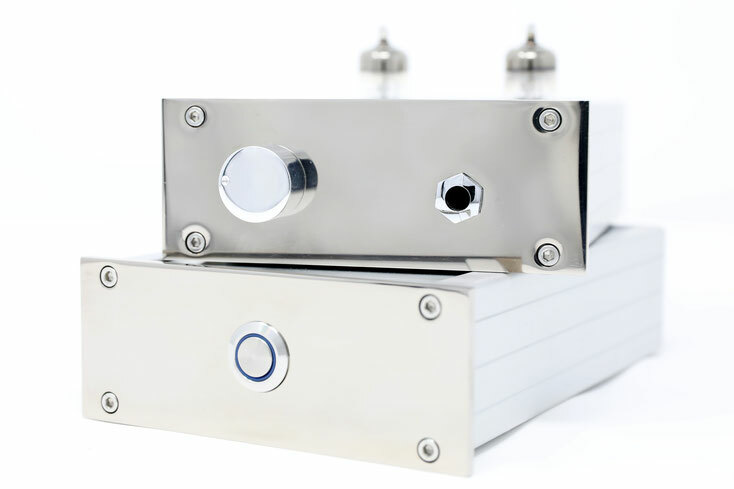 For volume control, we focus on the quality Alps potentiometer, this guarantees a high constant velocity. The standard includes the gilded WBT Nextgen RCA jacks, which can be installed on request in pure silver.